Food compliments travel perfectly, and if you are as adventurous with your palate as you are with your destinations, you are certain to find an extensive variety of dishes to try whenever you travel to a new city, region or country. There are so many cuisines out there to experience, but have you tried the following? The national dish of the Middle Eastern country, mansaf features lamb that is seasoned with lots of delicious herbs and spices, cooked in yoghurt and served on rice and flatbread, it is certainly an unforgettable meal. If you are staying at either Kempinski Hotel Aqaba, or Kempinski Hotel Amman you should definitely try this large sharing dish, perfect for special occasions. It is even the signature dish at Kempinski Hotel Ishtar. While most barbeques across the world consist of cuts of marinated meat cooked over heat, when Mongolian boodog is eaten the traditional approach to barbequing is reversed. Boodog consists of goats or marmots which are filled with red-hot stones which cook the meat from the inside out, to ensure it is cooked evenly. This can be tasted by guests staying in Ulaanbaatar when staying at Kempinski Hotel Khan Palace. A Bavarian classic, obatzda is a cheese-based dish featuring spices and onions. It is a beer garden favourite, and even features beer in the recipe. Eaten with bread and radishes, it is definitely something to try during your next visit to one of our nine hotels in Germany, including Berlin, Munich and Hamburg. If you are visiting Kempinski Hotel Fleuve Congo, make sure to try moambe, a traditional stew made of beef, chicken or mutton stewed in African palm oil, onions and tomatoes. Served with fufu, a starchy Congolese staple, moambe is an exquisite meal. Translating as 'mix-mix', gado-gado is a delightful Indonesian dish that combines multiple cooked vegetables and is served with tofu and lots of peanut or cashew sauce. It is light, healthy and can be found throughout the country – perfect for guests of Hotel Indonesia Kempinski looking for a fresh bite. 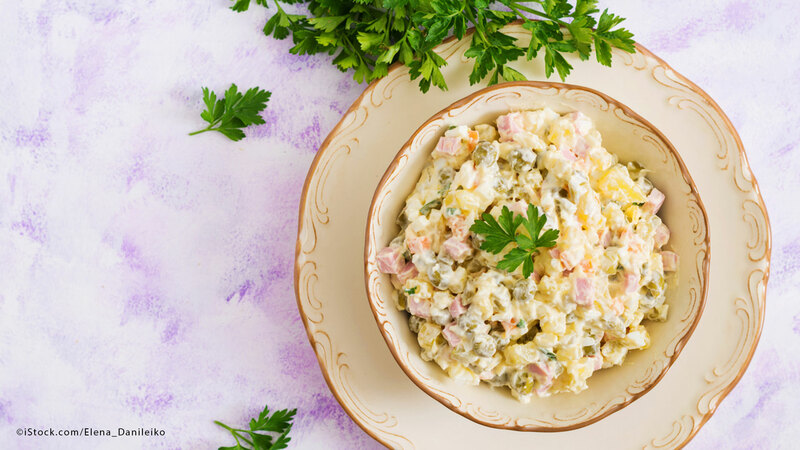 A classic Russian salad, Olivie (also called Olivier Salad) is a mayonnaise-coated mix of carrots, eggs, potatoes, cured meat and pickles. It is extremely flavoursome and you will find endless variations throughout the country, whether you are staying in Moscow, St. Petersburg or Gelendzhik. If you love delicious seafood that is simple in its creation, you will love sarde in saor, a classic Venetian dish that combines sardines onions and vinegar, at a two to one ratio – two kilos of onions versus one kilo of sardines, for example. The sardines are deep-fried, onions lightly stewed and fried, and the resulting ingredients are reduced in vinegar and left to stand for at least a couple of days. A highly recommended dish to try when you are staying at San Clemente Palace Kempinski. It seems appropriate to end our globe-spanning culinary journey with dessert, and none is as enjoyable as Hungary's delicious dobos torte. Featuring eight thin layers of sponge cake covered with chocolate buttercream, topped with caramel and cooled, it is decadent and looks amazing – perfect for guests of Kempinski Hotel Corvinus celebrating an occasion. If you like the sound of the dishes above, take a look at our range of hotels to plan your next trip.